The 18th Amendment is about Prohibition - Liquor abolished. Summary: The 18th Amendment was ratified in 1919, during the administration of Woodrow Wilson, banning the sale, production, importation, and transportation of alcohol across the nation. When was the 18th Amendment passed? Amendment XVIII was passed by Congress on December 18, 1917 and ratified on January 16, 1919. Prohibition era lasted from 1920 - 1933. The 18th amendment was repealed by the 21st Amendment. Woodrow Wilson was the 28th President of the United States whose presidency spanned from March 4, 1913 to March 4, 1921. One of the key events during his presidency was the ratification of the 18th Amendment to the Constitution. Why was Prohibition introduced? What were the Causes and Reasons for Prohibition? There are several reasons why Prohibition was initiated. Anti-drinking feelings were stoked by many Americans who believed that alcohol should be banned on religious and moral grounds. The temperance movement had gained support in rural areas who feared the temptations found in the cities. It was also a difficult time due to the effect of WW1 and the mood of the nation was somber, it was argued that drinking alcohol was damaging American society. Anti-saloon groups were set up, women backed these fearing the damaging effect of alcohol on the male members of the family due to the medical and social implications of drinking. Many politicians backed Prohibition, some because they would get the votes of people who were against the consumption of liquor. For additional facts refer to the Prohibition Era. Congress enacted the Volstead Act, officially known as the National Prohibition Act, to enforce the amendment, which became effective on January 29, 1920. The meaning of the words and phrases in the 18th Amendment of the Constitution are explained as follows - this was Repealed (cancelled) by the 21st Amendment on 12/5/1933. After one year from the ratification of this article the manufacture, sale, or transportation of intoxicating liquors within, the importation thereof into, or the exportation thereof from the United States and all territory subject to the jurisdiction thereof for beverage purposes is hereby prohibited." Explanation & Meaning: This gave warning that starting on January 16, 1920 it would be illegal to make, sell, transport, import or export alcohol anywhere in the United States or in any of the US territories. Meaning: This confirmed that Congress and every state were empowered to enforce this law. Meaning: This will not be effective unless it is ratified by the legislatures of the states within seven years from the date it was sent to them. The above information provides the text, definition and summary of this change to the Constitution. 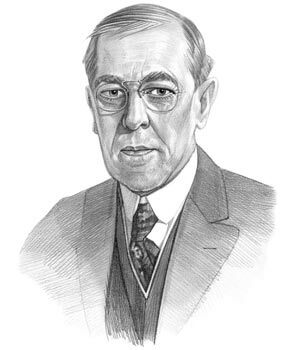 The following Woodrow Wilson video will give you additional important facts and dates about both the personal life and political life of the 28th President of the United States whose presidency spanned from March 4, 1913 to March 4, 1921.